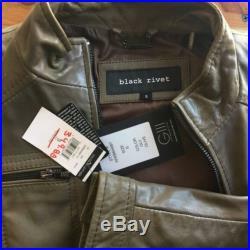 This wear-everywhere scuba moto jacket designed with many details of fine stitching at the shoulders, pockets area with side tabs and adjustable buckles. 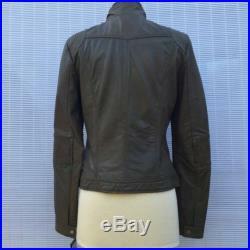 This jacket made of 100% genuine soft and fine leather. 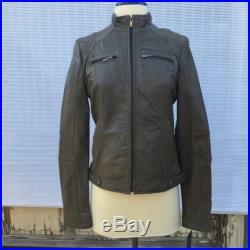 It has a classic stand collar, 2 side pocket on each side, 2 zipper pocket on the top and one button on each sleeve. Various pockets make it a very functional jacket. The interior is lined with brown lining. 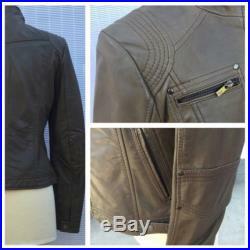 This jacket can be wear casually as well as with formal outfits, since it has a classic fit. Note: modeled on a small size mannequin. Please check measurements to insure a proper fit. You can compare these with something from your closet that fits you well. Note: we do our best to illustrate and describe each item accurately. Please see all photos, as they are an important part of the product listing. If requested, more photos and details can be provided.